Rural Revolution: So what did you do on 11/11/11 11:11:11?? 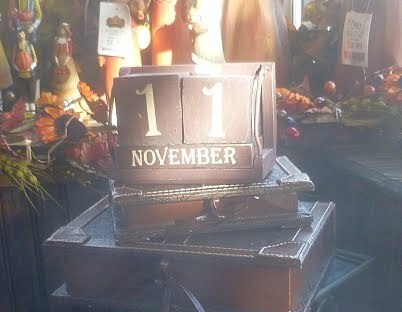 On this most auspicious date of 11/11/11 (which, surprisingly, did NOT herald the end of the world), I had a most boring day. I had snow tires put on our car. Up to this point, the weather has been nippy but dry. 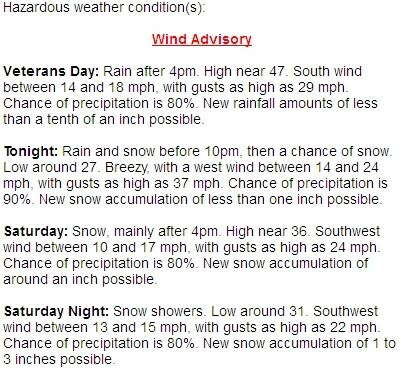 However here's the weather forecast for the weekend, predicting the first snow of the season. Not much, but enough to make the roads slippery. And our regular tires were practically bald. ...going about 26 mph down a steep incline. Not much I could do about it except be patient. By the way, it's worth noting that I left home around 9 a.m.
Les Schwab is the local tire place, and let me tell you they get swamped before the first snowstorm of the year. Swamped. I signed in, handed over the keys, and was told, "Five hours." No surprise there. So this charming little corner café became my home away from home for the day. And that's where I was when the auspicious moment of 11/11/11 11:11:11 hit. And this is where I stayed for seven hours. I didn't mean to practically move into the café, honestly I didn't, but there were lots and lots and lots of other customers ahead of me at Les Schwab. Those hard-working men were changing tires as fast and furiously as they could. I finally headed home around 4:15 pm, just as it was getting dark and just ahead of the storm. As I write this, it is howling wind and pouring (and I mean pouring!) rain. It's supposed to turn to snow later this evening. Meanwhile, with the wind we're experiencing, I wouldn't be the least bit surprised to lose power. So what did you do on 11/11/11? Patrice, at the afore-mentioned time, I was working my second job, buried deep inside a kitchen cabinet, putting in new drawer glides. One of my fellow church members is doing a sizable remodel and has hired me to do a lot of the stuff he can't do. 11/11/11 Today was a day off from work, so I took young daughter to the mall and had Christmas card pictures taken. We are not anticipating snow here in So Cal like you. In fact, tomorrow I'm planning on taking young daughter and going jogging. Elk hunting today in the snow, but it was melting so not too helpful for tracking elk. I was at playgroup with my little one, organising painting and cutting up fruit. Hey, you guys. You were off work today because it was Veteran's Day! It is one day where we're supposed to show our appreciation of the men and women who dedicate (and sometimes sacrifice) their lives for our freedom and security - past, present, and future! At 11:11 on 11/11/11, I was watching the fourth largest Veteran's Day Parade in the USA. I'm proud to be an Okie. Thanks to all of you who were and are in our military! At 11:11 today, my husband, three friends, and I were cutting and stacking wood for a widow from church. She retired early to care for her husband, who did pass away 9 years ago. Because of "interesting" rules regarding pensions and social security, she had to return to work. At age 69 she still works even though her health is not good. Since she has no central heating system, just a fireplace and electric space heaters, those of us who are able help get her set for winter. Since her late husband was a veteran, I think it was an appropriate way to spend the day since I didn't have to work myself today. Where we live in Southern California, it gets down to freezing temperatures, and we do occasionally get snow. It was a blessing to fix it so she can be warm. At 11:11 on 11/11/11, I was outside with my dog Baron. He has paralyzed back legs but now gets around with a wheelchair,(see photos here: https://picasaweb.google.com/essellhaynes/BaronSWalkinWheels). All in all though, maybe it would be a good idea to invest in a floor jack and a four way lug wrench so that the wheels could be changed out at home. It could save a lot of time, maybe an hour as opposed to five or seven hours. Remembrance Day in Canada! Remembering the sacrifices of our veterans. Please go into the archives and re-read July 10, 2010 all the way to the last sentence. Are you "at the mall"? The snow drove home how quickly we need to move on finding a new home, too, since we don't want to be doing roof inspections on roofs we can't see, or stand on... sigh. I completely forgot the world was supposed to end yesterday..my bad ;^) I was at home. I was thinking the same thing about that wind, Patrice. I told my husband as soon as he walked in the door after work "You better go get your bath now and then fill the tub with water because we just might lose power with this wind" (we're on well water), of course he was already on that page, lol. I was at a friend's house with some of my family (4 were at work) making Thanksgiving wreaths and most importantly I was celebrating my youngest son's 17th birthday! Being a Friday, I was in our local soup kitchen crying over a batch of onions that were doing their best to do me in before I did them in. We were rerouting electric fence wire and getting ready for the snow, which gave us 3-4 inches last night. We thank our veterans EVERY day. Before it comes time to take off the studded tires next year, search Craigs list or go to a junk or wreaking yard, and find 4 good wheels to fit your car. Take them to Les Schwab and have them put the studded tires on your newly purchased wheels. Then, next winter, all you have to do is jack up your car at your home, and put on your studded tires yourself. I only know all this because that is what my son did for me. Gives me a sense of security knowing they are always ready to go! On 11/11/11 I planted tulip bulbs and stacked firewood. I was probably stacking wood at 11:11:11. I was teaching Phonics to 2nd graders. We are at a Christian school and did not take the day off, but we did put on a school wide program honoring the veterans and then serving them brunch. Afterward I had to explain to my class why all of the teachers and parents were crying, especially while the veterans stood up and told stories about their service. It was very moving. I was in Germany at the NATO School, sharing a moment of silence with fellow veterans from all of the NATO countries. I was on the Acropolis looking at the Parthenon...seriously! I was thinking about my husband, since we were married on 11/11(1995)at 11am! I was clapping for our Veterans in the local Veteran's Day parade. 11/11 was an errand day for us, and we didn't do anything special.